You have the best of both worlds by being centrally located near the General Store yet still experiencing the serene surrounds of the Bunya National Park at your doorstep. 2-storey, 3-bedroom chalets are ideal for any Bunya Mountains visitors but are often booked by groups who want to be in the same vicinity to get together but have the separate dwellings for personal space if needed. Rice's Log Cabins consists of 5 comfortable, cottage style cabins set on two acres of landscaped grounds set 3,300 feet above sea level in a cool mountain atmosphere against a backdrop of the magnificent rainforest. Enjoy the best of both worlds in the chalet style home. Inside the gated estate, yet a short walk to the store and the bistro. Watch the world go by from the expansive front verandah, yet relax in complete peace on the back verandah, with tall trees and wildlife at your doorstep. Spacious living areas and cozy traditional styling give visitors a relaxing and comfortable stay at Rainforest Views. Open rolling lawns at the rear give space for children to play, and wildlife to feed, all overlooked by the rear deck. Bound by the forest and away from close neighbours, this is a perfect location if you’re getting away for some quiet artistry, deep meditation or simply want some private relaxation. Linen is available for hire at The Store. 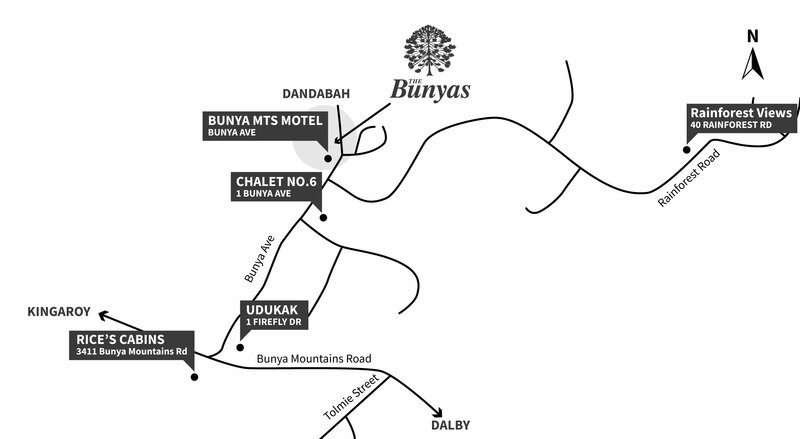 There is no service station on the Bunya Mountains, so make sure you fill up before you come! The Store stocks a variety of necessary groceries, but it is always wisest to bring food with you. Tick season at the Bunya Mountains is year round, so make sure to pack a mosquito repellent. It can be quite cool in the Bunya Mountains, even in summer, so don’t forget to pack some warm clothes. If you are hoping to dine at The Tavern for lunch or dinner, please make sure you book ahead to avoid disappointment!